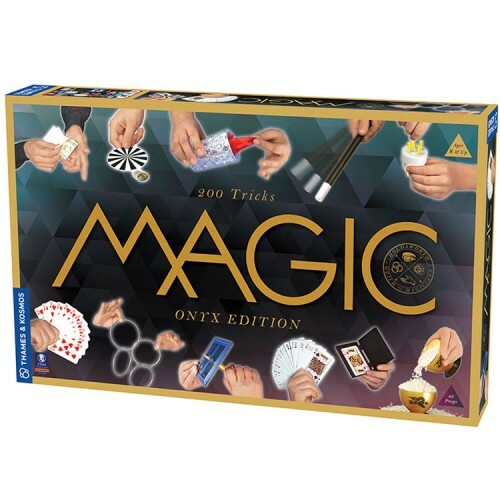 Prepare to astound your many family and friends audience members with the 200 amazing magic tricks from Thames & Kosmos' Onyx Edition Magic Kit! 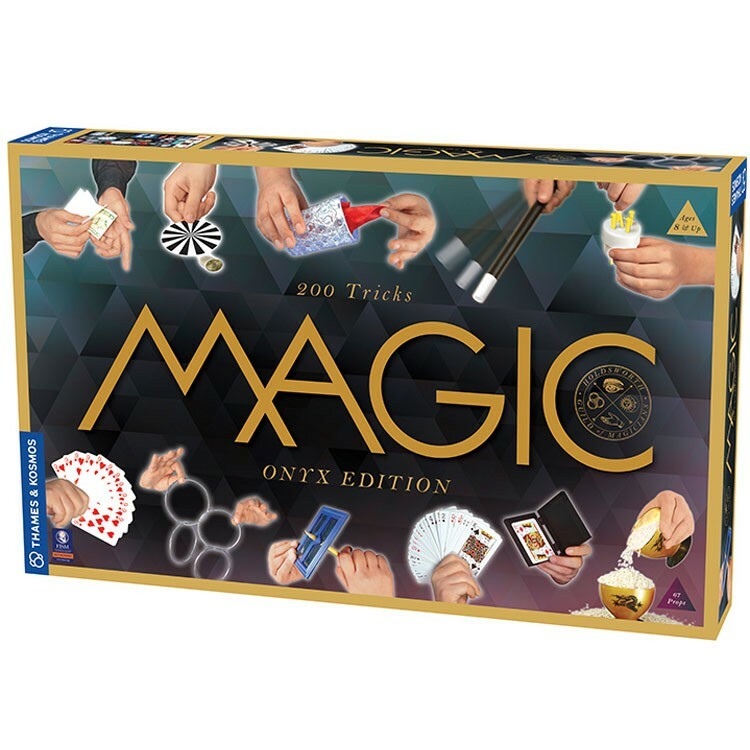 Prepare to astound your many family and friends audience members with this Onyx Edition 200 Tricks Magic Kit! 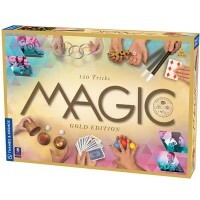 This comprehensive collection of magic props and illustrated instructions by Thames & Kosmos allows you to learn, practice, and master 200 tricks and illusions to amaze your audience. A magical water glass delivers some amazing illusions: A handkerchief materializes out of the empty glass, water changes color in the glass, liquid turns into fabric, and one playing card inexplicably changes into another. Dots appear and disappear in paddle tricks. 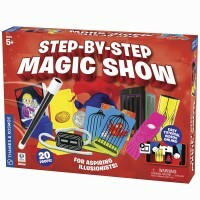 Your fingers play Houdini and escape from a rope snare. Little square sponges play big tricks on the audience by changing color, quantity, and location. The amount of rice in a bowl multiples with a marvelous, age-old Chinese rice bowl illusion. 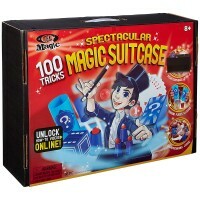 A pencil passes through a playing card without leaving a hole! Nails penetrate a metal coin. 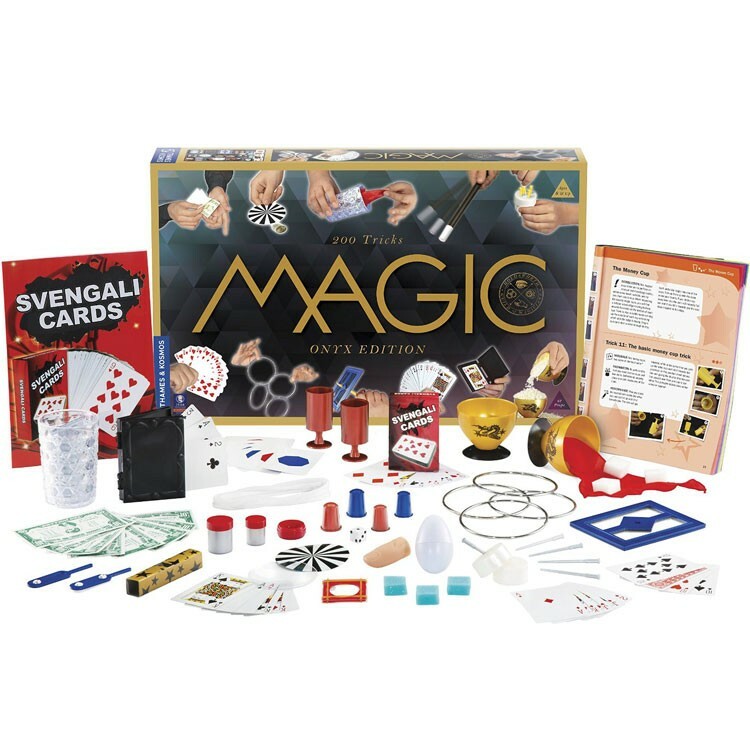 Coins pass through handkerchiefs and paper, disappear and reappear, double in value, and magically stay in place when they shouldn't! A six-sided die baffles the mind and fools the eye. Amaze your audience by correctly guessing the number of a die each time it is rolled. 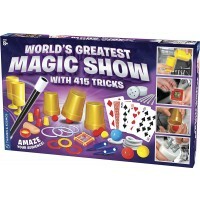 Stretch your audience's minds to the limits with rubber band tricks. 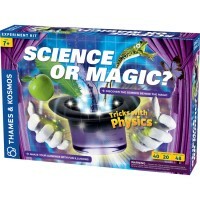 Conjure up a magic egg and use it for some baffling illusions. Make money from blank paper and karate-chop a banknote. 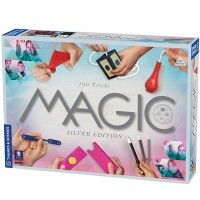 Make a thimble appear, disappear, multiply, jump around, and pass through objects. 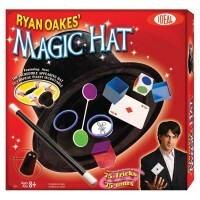 Levitate yourself, hypnotize an arm, bend and restore metal, and paralyze a ghost. 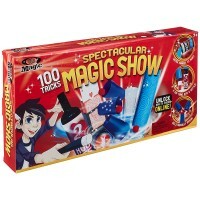 Perform tricks with food and household objects: Balloons are unpopped, toothpicks are unbroken, ice disappears, and sugar materializes in the palm of your hand. 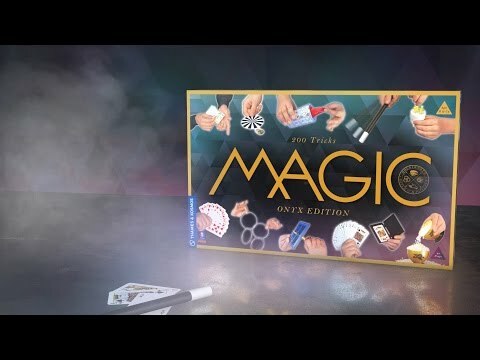 Finally, become a master of playing cards tricks using a special deck of cards and instructions for dozens of different deceits, ruses, gags, and illusions. 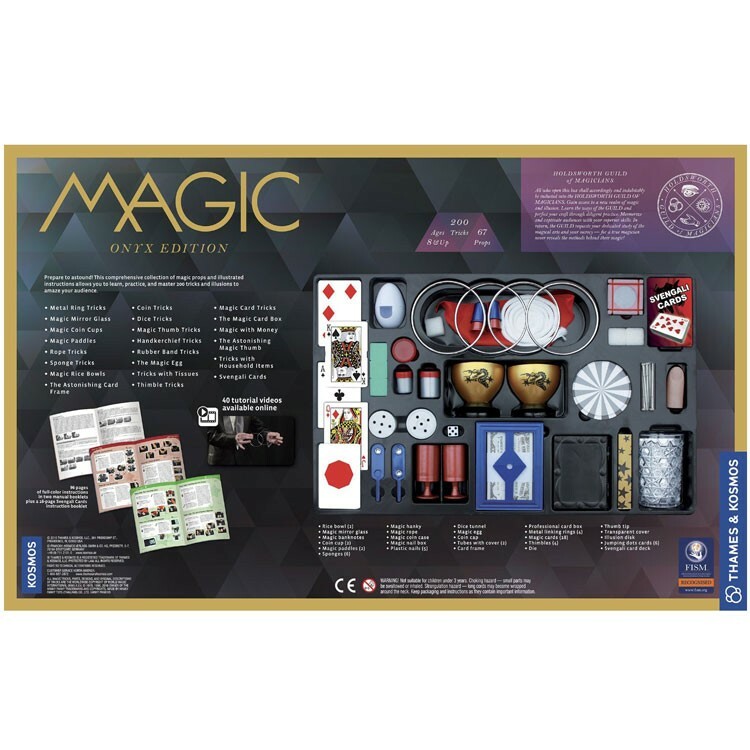 Educational Toys Planet's Onyx Edition 200 Tricks Magic Kit contains a 112-page instruction manual with color photographs illustrates how the tricks are performed. 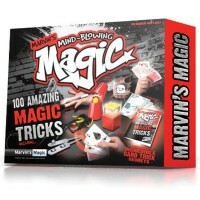 Video tutorials for the tricks are available online. 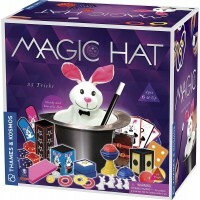 Dimensions of package 3.1" x 21.1" x 13.2"
Write your own review of Onyx Edition 200 Tricks Magic Kit .